This is a larger species. It is elongated and the carapace is keeled. The marginal scutes are flared. The carapace is dark brown to black with dull scattered spots or radiating lines. The plastron is deep brown to jet black...with or without patterns. Males can have white patches on the head and in some cases the head may be almost white. Care in captivity should mimic its natural habitat as much as possible. Ideally they should be kept in large outdoor pens. The pen should be located where it can receive some direct sunlight early in the day and dappled light the rest of the day The substrate should be leaf litter. In my pen, 1/3 is covered with at least 6" of composted hay. This provides an abundance of grubs, worms, slugs, millipedes and other food. The rest of the pen is covered with about an inch of leaf litter. Outdoor pens can be planted with shade loving plants such as ferns and Hostas. Also, they need a water source for soaking and drinking. I use large glazed ceramic flower pot bottoms partially sunk into the substrate. Indoor pens also should be as large as space will allow. For the most part aquariums are unsuitable. A minimum sized pen can be made from a 50 gallon Rubbermaid storage container. Although very functional, a storage container isn't very attractive. With a little imagination (and some carpentry skills), very attractive pens can be made. To the right is an excellent example by Ellen Friedman. When kept indoors, it is crucial that a UVB-emitting reptile bulb be used. I prefer the UVHeat type bulb. 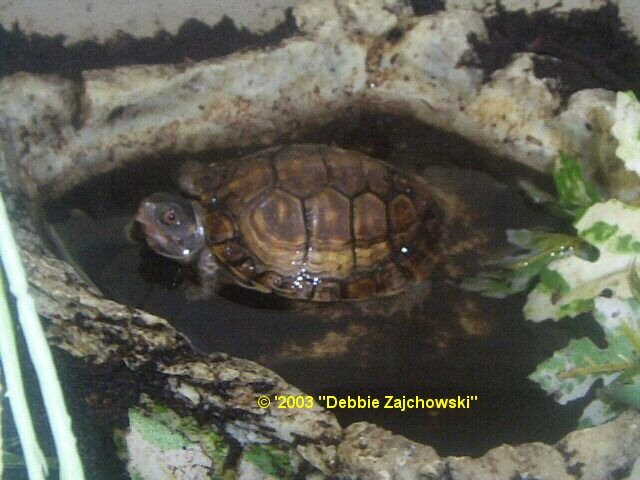 Eastern Box Turtles like to soak often and should have an adequately large water dish that they can easily get in and out of. When kept indoors I usually soak them once a week in a large dishpan with a couple inches of lukewarm water. They tend to defecate in the water dish so these need to be cleaned daily. Humidity is a major issue. Most box turtles are kept far to dry. This leads to eye problems which are often mistaken for eye infections and/or respiratory infections. To keep the humidity high I use sphagnum moss/Bed-a-Beast/sand mix. This is kept moist with daily misting. They should have hiding spots and an area for burrowing available. Eastern Box Turtles should have a basking area that is maintained at 87-90°F., and a cooler, shaded area. 60% or more of the diet is composed of animal matter. Some of the "animal" matter they eat in the wild includes: slugs, snails, worms, grubs, caterpillars, beetles, pill bugs, sow bugs, centipedes, crickets, grasshoppers, spiders, flies, crawfish and carrion. Essentially, if they can catch it, they will eat it. The rest is plant matter. A large part of which is fungi (mushrooms etc). Moss, berries and grass are also eaten.